How are you doing? Are you enjoying the holidays? And the Carnival? Have you dressed up? I guess so because some of you told me about your costumes before the holidays. As for me, I dressed up as a cat on Saturday. You know I love animals so on Saturday I felt like one of them!!! Here you are a pic of me and two of my lovely friends!!! What about you? Please, write a comment telling me about your costumes and about the things you do at Carnival. For example, do you eat Carnival Toasts? Do you do your costume yourself or do you prefer buying one? As you know, those who write a comment will get a positive mark!!! Have fun!!! and, by the way, I want to congratulate Amaia Escribano for her 14th birthday!!! I dressed up as Sandy the main character of grease and i went with my friends to see the festival, I had a great timee!! I dressed up like a 'Tirolesa' on Friday, Saturday and Sunday, but yesterday, I dessed up as KISS, the rock band (I was the cat too!). We've had a very good time. Very good Julia!!! I see you love dressing up!!! I had a fantastic carnival weekend. On Friday and on Saturday I dressep up as a ladybug with my friends. And on Sunday I went to ski! I love carnivals, they are very funny! On Saturday I dressed up as cow girl and on Sunday i went to Donosti with my friends dressed up as a bad pijama baby! I hope you enjoy so much as me! Me, I danced in a "comparsa". Our dresses where very strange, but I enjoyed a lot! We where dressed of the four seasons. It looked strange but it was beautiful, and we've won the first place in big "comparsas"! Hi Garazi! 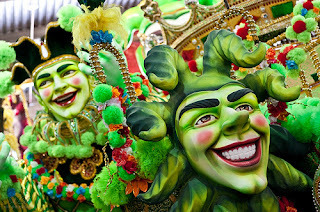 I'm Iñigo matos :) the carnival is very beautiful ! My friends and I dressed up as cows but one friend dressed up as a shepherd. It was very funny. next year, I would like to dress up as mike wasausky, one of the main characters of monsters INC.
Ander! thank you very much! I'm glad you like the picture! But Iñigo and you should tell me about your costume or about what you did, don't be shy! Garazi I don´t celebrate Carnaval because I went to Gavarnie Ski station whith my friends and I really like it. On Friday I was ill, but on Saturday and Sunday I dressed up like a "Tirolesa". On Monday, we go to Tolosa and we dressed up as KISS. We love carnival, but the holidays are very short.